ALS Safety are a company that provide a variety of different health & safety training courses to their customers in order to improve peoples knowledge and help them gain qualifications as well as offering a range of products for their customers to purchase. So they had a number of requirements and needs for their new website. They were looking for a site that would promote their business, and help attract new customers by being creative and interesting. 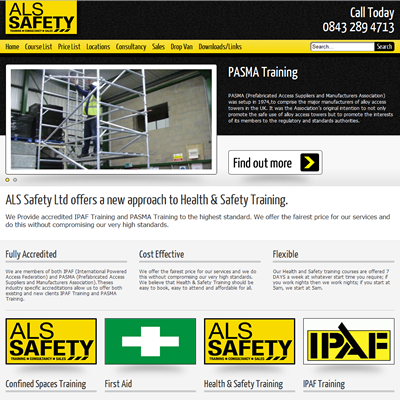 They also wanted a site that was easy to navigate and had various imagery in order to grab the customers attention however with enough content for the customer to gain all the necessary information that they need. 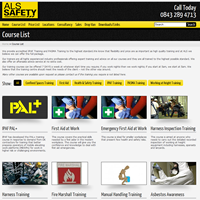 With these requirements in mind we were able to create a brand new site for ALS. 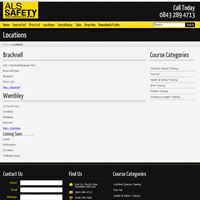 Through the use of various pictures and links we were able to make the site easy to navigate and extremely informative to the customer, meaning that the customers are now able to access all the information that they need as quickly and easily as possible. 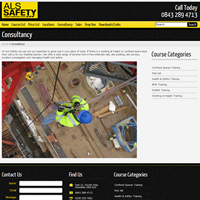 We were also able to give the site a modern feel, through the use of picture sliders and various other clever effects, helping the site become more interesting to view. 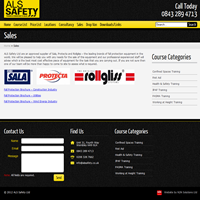 ALS Safety have been extremely happy with the new site that we designed for them. It has helped customers access the correct information that they are looking for, and has also helped advertise their business in a much more accessible way in order to generate more business. They feel that it has reached out to their online users enabling them to generate more business and attract more customers.